These photos were taken at the Gazebo right outside the Drake by the Oak Street Beach entrance as we were leaving for the weekend. It looks all well and good here, but later that day was when we had that crazy tornado scare here in Chicago. I kind of freaked out and hid in our bathroom at home with all my valuables. Luckily we were safe. Kind of a crazy ending to such a relaxing weekend. 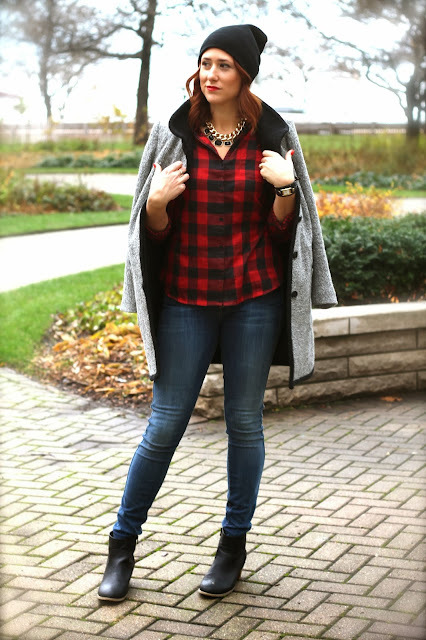 A staycation is a fun idea, and you look super cute and cozy in your buffalo plaid! Thanks. I'm loving buffalo plaid right now. We are totally having a moment.